Testimonials - You CAN Go the Distance! Bruce, I love the chapter! I feel honored that you would include Yasso 800s in your book! Bruce Van Horn understands the new world of engagement better than anyone I know. He is constantly uplifting and coaching others. He is always available, helping others get over their plateaus, and move to the next level. Bruce will help take “can’t” out of your vocabulary and replace it with “CAN.” He constantly puts out value into the world which makes the world a much better place. Bruce helped us start and coached our middle school cross-country team at GCA. He motivated our kids to reach goals that they thought were unreachable. By the end of the first season, they were working together as a team, helping and encouraging each other as Bruce taught them. GCA benefits to this present day from Bruce’s motivation and leadership. I’m just training for the half, but I do appreciate getting “permission” to slow down because I have felt that I need to keep my pace no matter what. But, injury or burnout is not worth it if I can’t meet my goal. Thanks! — Angie B.
Bruce, this was exactly what I needed today. I’m training for Richmond too! This will be my 2nd 26.2 and I’m hoping to break 4:30. I had heard about Yasso 800s but have never tried them. I’m going out tomorrow to give it a try. Thanks! — Cathy G.
Bruce, this was most helpful, thanks! 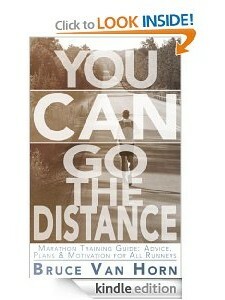 I’ve only run 10Ks up to now, but a friend of my has been trying to talk me into a marathon. I think I’m ready to try it! — Pete A.
Bruce, I’m thinking about running my first marathon, I’m loving your message to beginners 🙂 — Carlos A.